All the do-it-yourself information you need for your home repairs. 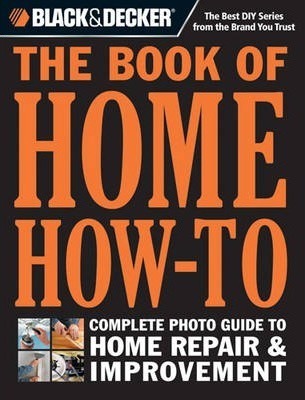 BLACK+DECKER The Book of Home How-To is easy to search through, even easier to use. The editors at Cool Springs Press know a thing or two about DIY home improvement and maintenance; we've been writing about it for the past quarter-century, and we have more than a few bestsellers under our tool belts. Until now, there's been one thing missing: an ultimate, fully-loaded, reference book for every home project you can dream of; the compilation of our longstanding expertise; the home how-to book to crush all others. The good news doesn't stop there; BLACK+DECKER The Book of Home How-To is designed to reflect the way we search for information today. You won't find chapters or long, boring introductions, or even a table of contents. This book is an A-to-Z encyclopedia with precise how-to instructions and clear photos packed onto every page. With an expanded index that is incredibly intuitive and a simple, alphabetical strategy for organizing the information, you won't spend precious time wading through stuff you don't need to know. And that's just scratching the surface. Just about any repair or remodeling project you can imagine is right here, at your fingertips. The Editors of Cool Springs Press have produced the highest quality DIY home improvement books for more than 30 years. In conjunction with the experts at BLACK+DECKER(TM) they have combined resources to create more than 200 home improvement titles that provide consumers and weekend DIYers with the information they need to get the job done right. Their books have set the standard for do-it-yourself publishing, featuring clear, professional photography and concise step-by-step instructions that get straight to the point. View our full catalog at quartoknows.com or connect with us on Facebook (facebook.com/QuartoHomes), Twitter (@quartohomes), or Pinterest (pinterest.com/QuartoHomes).